Think back to November 2017—you remember, the Houston Astros had just won their first World Series, you couldn’t go online without seeing Salt Bae, and we still didn’t know what Luke Skywalker had been up to since the ’80s. 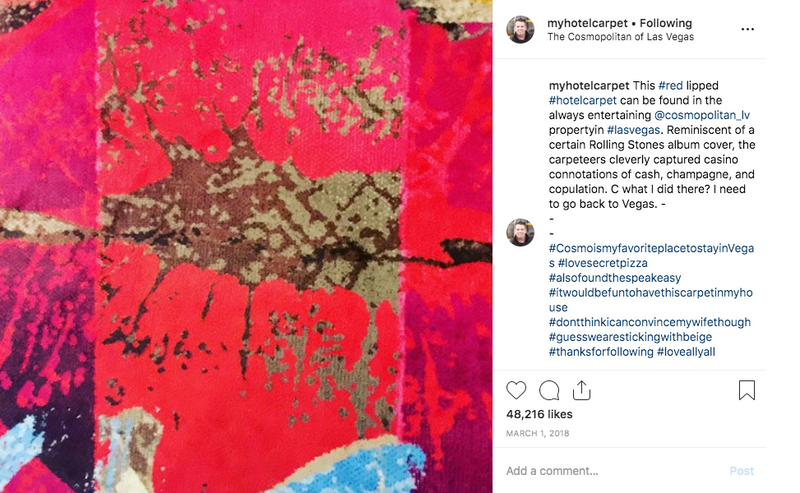 You might also remember the viral Instagram account, @myhotelcarpet, run by Corporate Pilot Bill Young to share—you guessed it—hotel carpets. Needless to say, we’re big fans of his feed, but we were even more interested to learn about the travels of a man who is abroad enough to sustain an account like that. For those who missed it the first time around, we’ve got Bill’s take on how @myhotelcarpet went viral in 2017. And then, we’ve got his pilot-approved travel hacks on everything from beating jet lag to seeing the Northern Lights on your next flight. Currently, my Marriott app shows I have 2,050 lifetime nights. That is to say, I spend a ton of time in hotels. 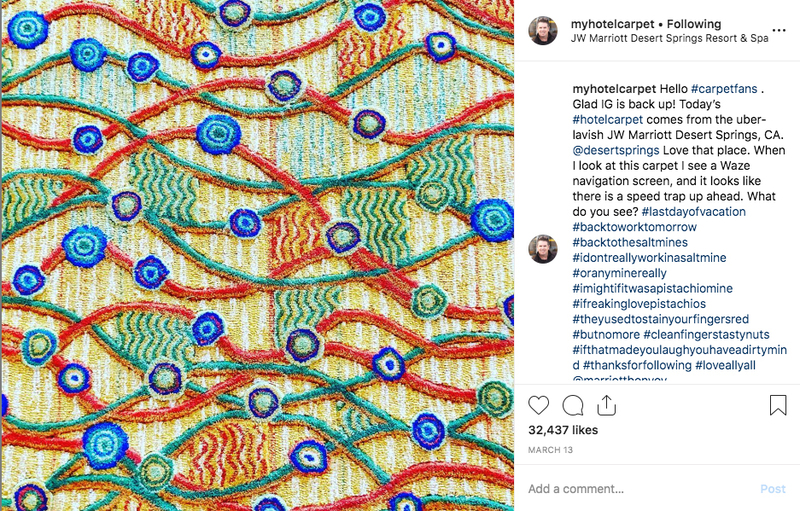 It wasn’t long before I noticed that they often have crazy carpet patterns, so I started photographing some of the more intricate designs, and from there @myhotelcarpet Instagram account was born in 2015. I mostly just used it to amuse myself—seeking out crazy carpets became something to do during layovers. By November 2017, after careful cultivation, I had amassed 83 followers. 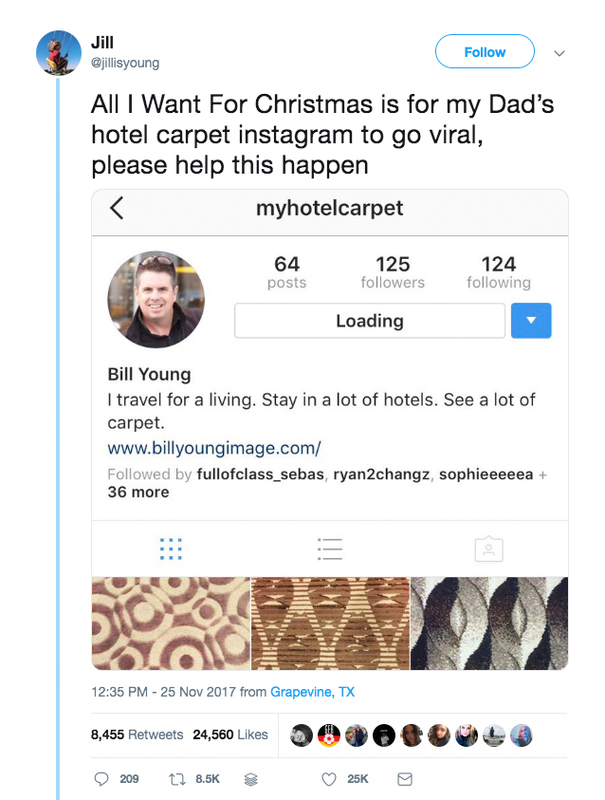 Then, last year while my daughter, Jill, was home from school during a break, we were joking about the @myhotelcarpet account, and she said she was going to try and “grow my audience.” She sent out a tweet, and a few new followers trickled in. By the time I went to bed I think I reached 100 followers—I was psyched and proud of my daughter. The next day during pilot training, my phone started melting down with notifications from each new follower. I had to put it on airplane mode and eventually disable notifications. Within days, I went from 83 followers to more than 500K. What’s the best view you’ve ever seen from the cockpit? 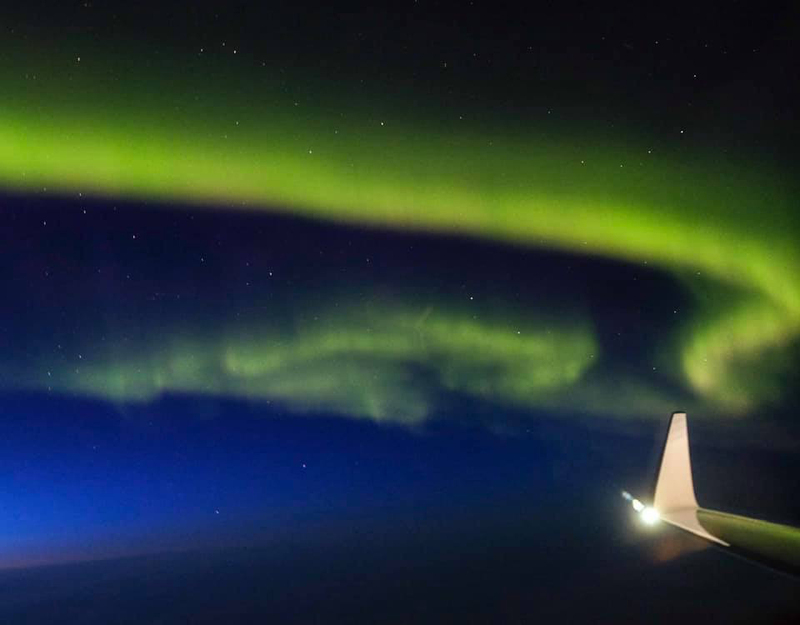 My favorite spectacle to see from the airplane is the Aurora Borealis. The dancing, mostly green clouds of plasma never fail to amaze —even after witnessing them several times. If your flight route is at a fairly northern latitude (like flights to Europe from the western half of the US or flights from Europe to Asia), you’re in the right area. It also needs to be dark, so flying east through the night is your best bet. And you need to have a view of the northern sky, so if you are flying east, get a window seat on the left side of the airplane. Lastly, the atmosphere needs to be magnetically active. There is a free app called Space Weather, which can predict the aurora activity during your flight. As a pilot, how early do you have to arrive at the airport? If I’m doing an international trip the crew arrives at the airport two hours prior to takeoff time. Occasionally we can utilize a VIP terminal that reduces time, but doing the “bag drag” through the airport is fairly common. What happens behind the scenes that’s most surprising to passengers? Passengers tend to be surprised when they find out how much work actually happens in the cockpit. It’s not just a matter of turning on the autopilot and then talking about the cute passenger in 3A. Pilots use the autopilot to reduce the physical workload, so they can increase their situational awareness and enable completion of other tasks, such as communication, navigation, monitoring systems, fuel, weather, etc. Crossing oceans involves physically plotting and verifying position and determining where to divert to in case something happens. Is there anything that passengers do that the flight crew hates? 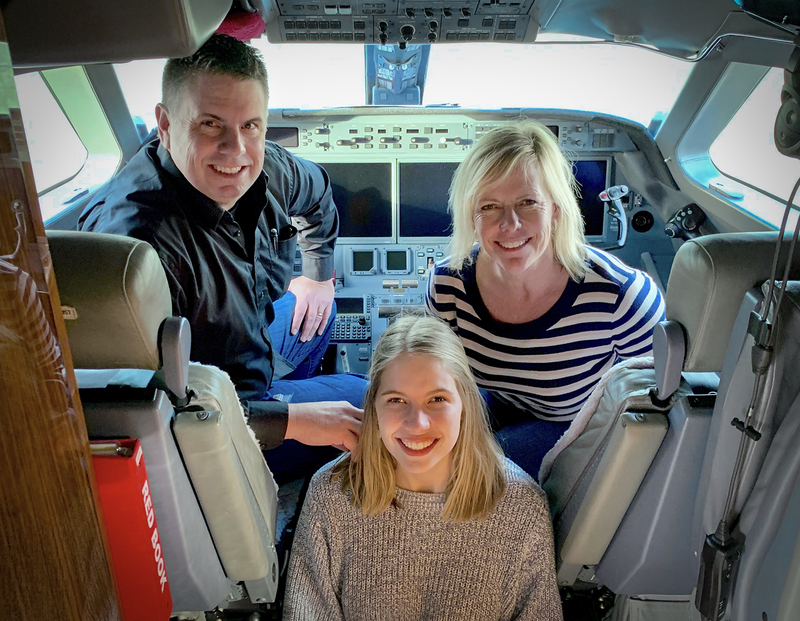 I am currently flying business jets, but I have flown for a major commercial airline, and I married a flight attendant, so I know what can irk the cabin crew. Flight attendants get annoyed when passengers press the “flight attendant come here” button for everything. There are times, of course, when pressing the button is appropriate, but for the most part, you won’t make any friends being overly needy. Do you have any advice for nervous flyers? I like to say the most dangerous part of the flight day is the drive to the airport. Oftentimes, nervous flyers are worried about turbulence, but there is little chance of damaging the aircraft from turbulence—the only danger is falling or hitting the ceiling, but if you wear your seatbelt you will be okay. The plane isn’t going to break because of turbulence. How do you stay alert during long flights? We often have flights that last 12 hours or more, and for those, we utilize a third pilot and have a crew rest area on the airplane. Usually, the pilot who is making the landing takes the last crew rest period, so they can be in the cockpit an hour before landing. We often joke that the coffee pot is the most important piece of equipment on the jet. Photo: Bill Young • Bill with his wife, Heidi, and daughter, Jill, who made the @myhotelcarpet account go viral. Jet lag is a major part of my life. I cross oceans multiple times monthly, and my best advice is pretty straightforward: Try to adapt to the local time zone. No matter how tired I am, I stay awake until at least 8 p.m. local time—10 p.m. is better. I also try to exercise and go outside where I can see the sun, which will help reset your body clock. What’s the most surprising thing in your suitcase? I always bring a swimming suit—you never know when you might need it—In a side pouch of my suitcase, I carry a small roll of duct tape in case I have to fix something, and a wine opener, in case somebody needs wine opened. What’s the best sub-$200 hotel you’ve stayed in? I’ve actually stayed at the Tianjin Ritz Carlton in China for less than $200 US—gorgeous hotel. In Europe, if I’m traveling for pleasure and not staying free on Marriott points I’ve had great luck with Airbnb. Often you can get a nice apartment in the center of the city for less than $150 a night. I’m a sucker for a cool pen. If the hotel has nice pens in the room I’ll take them all—I figure I’d be remiss not to. Lastly, which hotel carpet has been your favorite? That would have to be the Cosmopolitan resort in Las Vegas. Their design choice is bold with a hint of whimsy.